Introduced in 2006 and updated in March 2008, the AUD$129,000 GS450h is the world’s first rear wheel drive hybrid petrol/electric. The 3456cc V6 petrol engine is a sophisticated design using both direct and indirect fuel injection. The camshaft timing is variable for both the inlet and exhaust cams and the intake manifold is also of a variable design. The compression ratio is high at 11.8:1 and 95 RON fuel is needed. Peak power of the engine is 218kW at 6400 rpm and peak torque of 368Nm occurs at 4800 rpm. So unlike the soon-to-be-replaced family relative Prius, the GS450h uses a state-of-the-art petrol engine. The electric system features two motor/generators. The more powerful of the two is rated at 147kW and 275Nm, and runs at 650 volts. Because of the way in which the Lexus hybrid system mixes these two power sources, you can’t simply add the outputs of the petrol engine and electric motor to get a total power output. 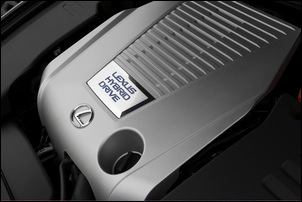 Instead, Lexus lists the total system output as 254kW. But – and perhaps confusingly – the immediate availability of torque from the electric motor gives the car greater performance than the ‘254kW’ figure would indicate. Lexus figures suggest a 0-100 km/h time of 5.9 seconds and a standing 400 metres of 14.4 seconds. We didn’t test the car against the clock but would suggest that while these times are a little optimistic, the 450h is certainly still a very quick machine. But it’s also a heavy one. 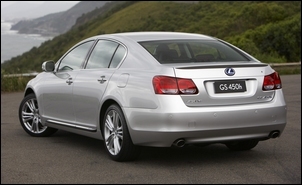 Even in base GS300 trim, the GS-series aren’t light-weight cars, and at around 1930kg, the GS450h is on the porky side. In addition to adding weight, the nickel metal hydride battery pack – it fits behind the back seat – also reduces boot space and prevents the car having a fold-down rear seat. In fact, overall packaging is not very good – the rear seat hasn’t the room you’d expect given the car’s dimensions, and even the front seat space feels more ‘compact and enclosing’ than ‘luxurious and sprawling’. The controls and instrumentation are beautifully integrated and clear. In fact, despite the sophistication of the car, it’s easy to get in and immediately drive. The only trick is that a bunch of controls - including those for the electric mirrors – are normally hidden by a panel that folds up into the lower-right side of the dash. Press a button and these seldom-used switches pivot down into view. A large colour LCD screen is positioned mid-dash; this can display navigation, over-ride controls for the climate control and audio systems, and detailed fuel economy statistics. However, as with other Lexus models, the navigation system is poor. The voice instructions are repetitious and often contradictory (an actual example: “The freeway is on the left” followed without pause by “The freeway is on the right”); the interface is not intuitive and prevents the input of any data (even by the passenger) when the car is moving; and the navigation system can be quite slow to react. Rather than a tachometer, the driver is presented with an analog power meter that displays combined petrol/electric power up to 250kW and also has a ‘negative’ (but uncalibrated) swing of the needle to show regen braking. While we can see the pointlessness in this car of having a traditional tachometer, we’re not sure the analog display is very helpful. Much better to digitally display instantaneous power, as is done in the big brother LS600hL. The transmission is a continuously variable automatic that’s intrinsic to the Toyota / Lexus hybrid driveline approach. It features a manual over-ride; to be honest, we didn’t need to use it even once during our drive. Engine braking – a requirement that often presses into use a manual trans over-ride – was more than adequately achieved by the regenerative braking that occurs both when you lift the throttle and then in the first part of the brake pedal travel. 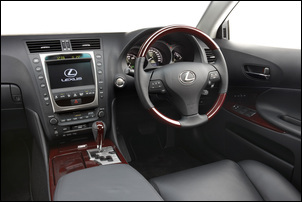 The GS450h is well endowed with luxury features: electric tilt/reach adjustable steering, radar cruise control (that maintains a set distance to the car in front), auto-swivelling headlights that move with the steering, fan cooled and heated seats, triple memory seats for both front occupants, and auto key unlocking and driving (you just keep the ‘key’ in your pocket). All of these features work well. Throttle response of the hybrid driveline is strong – this is a car that gets down and goes hard, whether that’s off the line or on a rolling start. A Power / Snow hybrid mode button is fitted – we didn’t experience any snow and found that the standard button position gave plenty of performance if you used lots of throttle! The automatic switching on and off of the petrol motor (eg it turns off when the car comes to a halt, and remains off at low speeds) is achieved seamlessly and with great refinement. From the driver’s perspective, the Lexus hybrid simply drives like a two-pedal automatic. Fuel economy? Glad you asked. On Sydney’s appalling roads we found the ride far too hard. The 245/40 Dunlop SP Sport 2030 tyres worn on 18 inch alloys fell into potholes with car-shaking thuds, and no-one riding in the car with their eyes shut would ever think it a luxury sedan. Put the dampers in ‘Sport’ mode and things just got worse. Consider the GS450h a sports sedan (it certainly has the performance and throttle response to match this tag) and then the ride is acceptable; think of it as an expensive luxury car and we’d rather be riding in a Holden Statesman. Grip levels are high and the action of the stability control system progressive and effective. The steering mixes very tricky electric weight and ratio changes and is good in weight and feel. However, a sensitive driver will clearly detect the ratio changing, a slightly disconcerting trait. We doubt the system has any real world benefit over a traditional, well set-up power steering system. 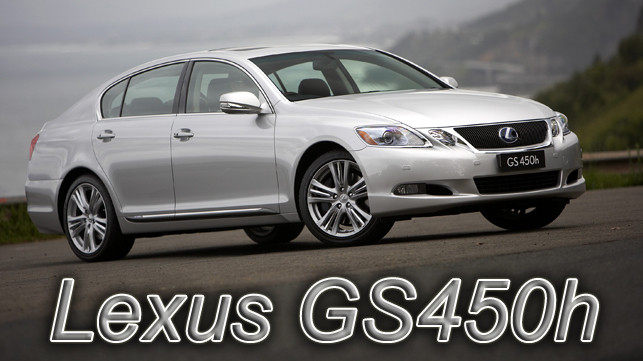 The GS450h is a car like no other. It isn’t a comfortable family car; it isn’t an out-and-out sporting machine; and it isn’t a super economical car. Neither is it particularly cheap. But it is superbly made, has many effective luxury features, strong performance and excellent fuel economy for its weight and power. And of course, it also has that fashionable green, high technology, hybrid cachet. You can dismiss it as an answer to a question on-one asked but that is to very much underestimate this complex, fascinating and ultimately highly effective car. 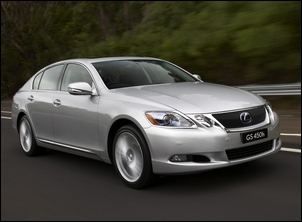 The Lexus GS450h was provided for this test by Lexus Australia.